Planning a trip to Italy? Check out our comprehensive Italian travel guide, and our award-winning walking tours in Italy. We can’t wait to show you our country! Want to know how to experience Christmas like an Italian? 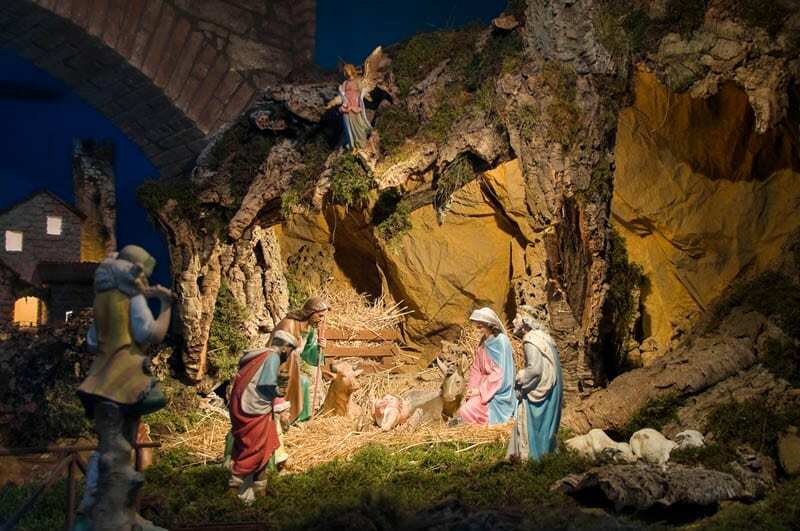 Here are some of the most popular Christmas traditions in Italy, and how to celebrate them! In other countries, Thanksgiving (or even Halloween!) signals the start of the Christmas season. In Italy, though, Christmas officially kicks off with the Day of the Immaculate Conception of Mary on December 8. This is when decorations go up (both on the streets and inside Italian homes) and when some Christmas markets start. Decorations and huge Christmas trees can be found in main piazzas, like in front of the Colosseum or in Milan’s Piazza Duomo, and Babbo Natale (Father Christmas, the Italian version of Santa Claus) spreads holiday cheer. As a semi-geeky aside, this holiday, which is both religious and state-sanctioned (meaning lots of offices and businesses will be closed on December 8), doesn’t have anything to do with the day of Mary’s conception. Instead, it celebrates the day when the Church decided that Mary was born without having the stain of original sin. (So no, no one is saying Mary was pregnant for only three weeks!). for more on those incredibly unique markets read our blogs on the 10 best Christmas markets in Italy and the Christmas markets of Venice. The eight days before Christmas, also known as the Novena, are filled with carolers singing traditional songs around the neighborhood. If you’re in Rome, southern Italy or Sicily, keep an eye out for the zampognari, or bagpipe players—they travel from the nearby mountains to play their merry folklore carols. Along with the fancy lights, wreaths and trees, presepi (nativity scenes) are displayed in many churches and piazzas. Crafting these ornate works of art by hand remains an artisanal tradition in many parts of the country. If you want to go to the source, head to Naples; the southern Italian city is world-famous for their hand-made presepi. It still has whole streets with one workshop after another devoted to the craft. (And Here are 9 other reasons you have to see Naples!). To prepare and purify their bodies for Christmas Day, Italians avoid meat on la Vigilia (Christmas Eve). Although the idea is to eat lean, most indulge on multiple courses of fish… sometimes as many as seven! If you want to stage a similarly decadent meal, read our post on how to have an Italian Christmas meal, including recipes! After the family dinner, many Italians head to midnight Mass at their local church to celebrate. (Some Romans even head to the Vatican for Mass with the Pope!). But traditions vary from city to city: Up north, in Cortina d’Ampezzo in the Dolomite Mountains, thrill-seekers ski down the slopes with torches at midnight to welcome Christmas. After the “light” Christmas Eve dinner, on Christmas Day, Italians invite their family and friends for a large lunch that usually goes on all day. Many save up to have the most lavish celebration possible, serving up traditional dishes like pasta in brodo (pasta in broth), roasts and traditional desserts like panettone. 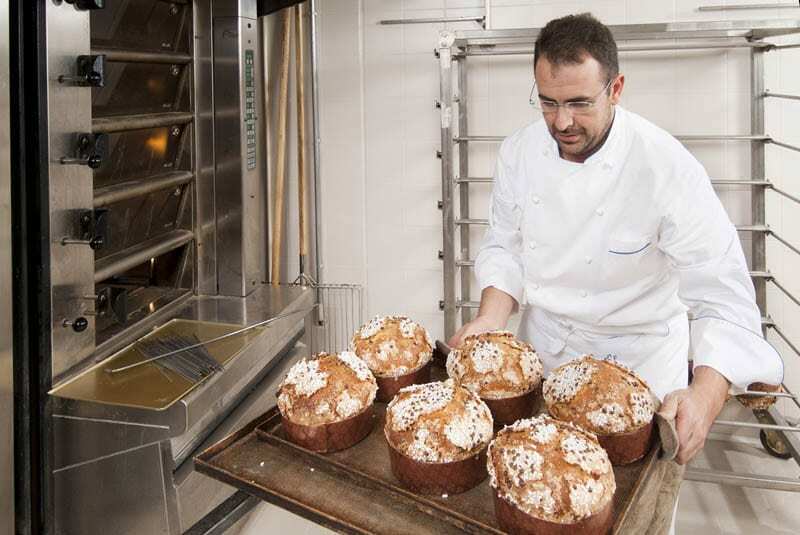 If you like the sound of that, don’t miss our post on Italy’s sweet Christmas breads, including panettone, pandoro and more!). Celebrations often extend into December 26 with the national holiday of Santo Stefano; families get together and eat leftover Christmas dishes and sweets. The official end of the Christmas season, though, isn’t until January 6—the Day of the Epiphany, and the twelfth day of Christmas. On the eve of the Epiphany, families usually prepare a large dinner to mark the end of the holiday season; children are given candy or coal (usually made of black sugar), depending on if they were naughty or nice. 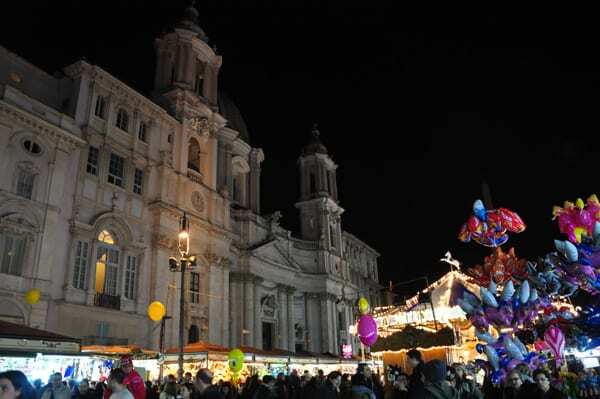 After January 6, you’ll see Christmas markets close and decorations start to come down. Ask an Italian when her family opens gifts, and it might give you a clue to where she’s from! Gifts are commonly exchanged on Christmas Day after lunch—sometimes with the belief that Jesus has delivered them – take that, Santa!. But some smaller, northern Italian cities believe that the blind Saint Lucia brings gifts for children on December 13, so they open them that morning. Other families may wait until January 6. The Epiphany is when la befana—a kind of “good witch” who is believed to have followed the wise men, but got lost—drops off presents. La befana is a particular tradition in Rome and Bologna, where the main piazzas often host fun activities for children; in Venice, locals believe that la befana arrives every year by boat! (Here’s more info on la befana, and don’t miss the opportunity to experience la befana through the eyes of a 5-year-old Roman, above!). Regardless of when they open their presents, many Italians keep their wrapped gifts on display on the pyramid-shaped ceppo, along with candles and other decorations. 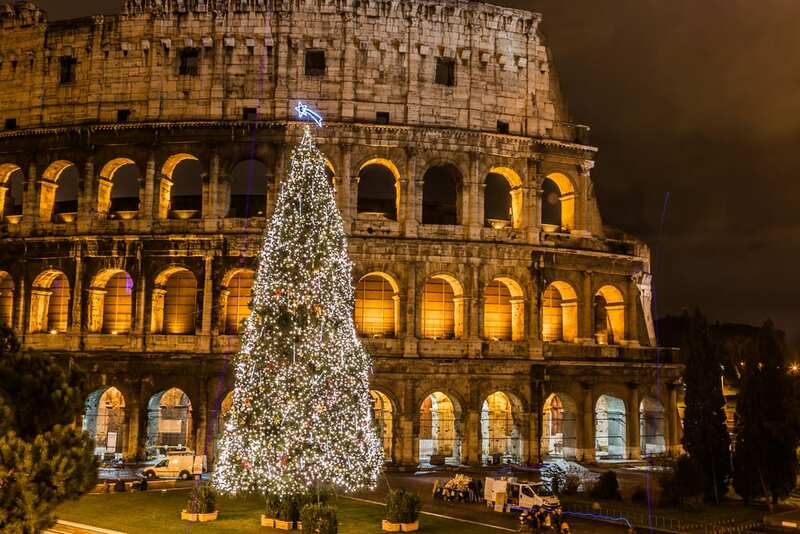 Have you ever celebrated Christmas in Italy? Tell us about it in the comments! We have celebrated Christmas with our family in Sicily. The many traditions mentioned are our traditions. We also receive short visits on Christmas Day from relatives who wish us Buon Natale before they proceed to their own family dinners. Also, near the city of Custonaci, in a cave on the mountainside, a presipio and a town is enacted by the locals. Very realistic and interesting. We lived in northern Italy for several years and always looked forward to the neighborhood Pan e Vin celebrations on January 6th. Huge bonfires with an effigy of la befana on her broomstick on top would burn through the night (and smolder for several days after) while neighbors would eat, drink and be merry. It was a wonderful tradition I will never forget. New Year’s Eve was also a huge holiday. Everyone had fireworks and they would go off all night long. Great fun! What a great post! Merry Christmas to you!!! My favourite Christmas in Rome was when I went with friends to Ara Coeli for the midnight mass. The buses had stopped. At 9:00 PM, we walked from Monteverde Vecchio down through a chilly Trastevere, crossing the bridge at Ponte Sisto, then across Via Arenula, through the ghetto, to the Capitoline Hill, climbing the 400+ steps to the church. It was slightly foggy, and we could have been alone in the silent city, because we didn’t meet another soul until we arrived at Ara Coeli. The service was beautiful. Just before midnight, a heavenly lullaby—a mezzo-soprano voice—floated from behind the altar into the candle-lit church. Then at the stroke of twelve, the priest brought the Bambino Gesù from the altar and we all followed in procession as he placed the life-sized statue into the Presepio—the creche—near the entrance of the church. . When we walked out of the church, we looked down upon a city that had come back to life: the buses were running; people were chattering, laughing, and rushing about their business. It had been a magical experience, and now the enchantment was complete. What a beautiful description! Thank’s for sharing your experience Francesca. We’re sorry you feel that way Joshua. Is there something specific we can help you find? I wonder if also foreigners are obliged to do the tradition. Do they really need to do that? Visitors most definitely don’t have to partake in Italian Christmas Traditions. They are traditions of Italy and might not be your own! Still, we think that some of the traditions can be a great way to understand and partake in the Italian culture! thanks for this nice text. I wish I can go there this christmas!! Hello. Is it a bad idea to try and go to Naples and Pompeii by train from Rome on Christmas Eve (does public transportation get really hectic)? Are most of shops/attractions closed on Christmas Eve? No it’s not a bad idea, but we do suggest you book well in advance – both for your train and, if possible, for your restaurant! Most restaurants like to know who is coming so they can prepare ahead how many staff to keep on and how much of their specialty food to buy, if not simply because the places fill up! Thank you for the wonderful post. The photos are beautiful, and the accompanying text, along with Francesca’s incredible description makes my heart long for this experience. I love history, and Ancient Rome is a pretty big part of that!! My grand-mother, on my fathers side, was a De Martino, from Naples, and Grandfather was Gianfrancesco, from, his mother and father who were from Abruzzi. The name was difficult to pronounce I guess, and his father became John Frank. (Gian Francesco) When they asked his name, he gave the last name only, hence John Frank. Millions of stories like that in America of all nationalities. Nona was an incredible cook. She stood about 5 feet tall in heels, and was just about as wide, and never ate when the meal was served, usually watching to see reaction to what she had made, and always saying one thing or another didn’t come out exactly right, but it always was!! Most of the women didn’t eat much….they were full from eating while cooking all day!! I was thinking about Constantine I, the Roman Empire, and how important he was to us all coming together for this wonderful and important day. This is helping me in a report i have to do on Christmas in Italy!!! Thanks for the person who made this web site. Thank you for the informative post. I have a question about Christmas holiday in Italy. What is Italy’s folklore for Christmas? I really loved all the stories wish I could go and experience it on my own. Thanks for sharing. Can anyone tell me why my Italian American family kept our tree up till January 15 th? Every year it was the same time. But maybe there was a holy day then that was moved. This was from the 1950’s through the early ’80s. Italians keep up their Christmas decorations until the Epiphany on January 6th. This is a Catholic holy day, when the three wise men finally made it to see Jesus. Today it’s also celebrated with a visit from the “Befana”, a sort of good witch that fills the stockings or shoes of the kids with candy. It marks the end of the Christmas season here in Italy.